Get fast access to access to the data on the external storage devices with the HPE H241 Smart Host Bus Adapter. It helps you to maximize the capacity server with space to add more storage device internally. 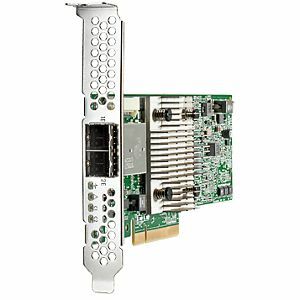 Its low profile design with PCIe3 x8 standup form factor provides the Gen9 Servers a reliable, high performing SAS connectivity to the data in the direct attached or shared storage solutions. Featuring eight external physical links, it delivers 12 Gb/s SAS performance with two interface ports. It provides flexibility to run as an HBA mode or simple RAID mode. It supports RAID 0, RAID 1 and RAID 5 along with optional HP Secure Encryption capabilities. This adapter is also ideal for data backup to an external tape drive and supports Windows, Linux and VMware operating systems. Order the HPE H241 Smart Host Bus Adapter today! 2.12" x 6.9" x 0.9"